That Jeans & T-Shirt look made famous by James Dean all those many years ago will never die. We’re guys, we wear jeans… They’re one of the pillars of day-to-day wardrobe for many. Here are some modern jeans that you might not have considered before but you should. 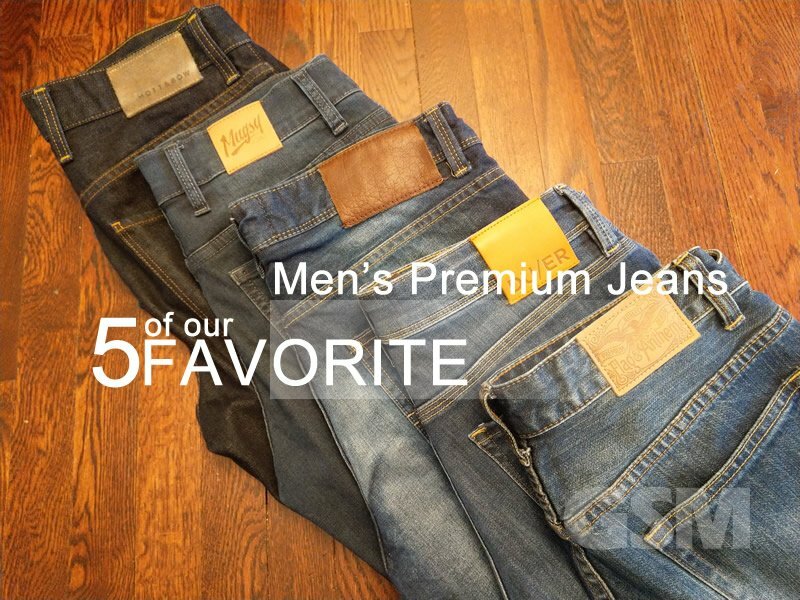 Let’s take a closer look at 5 of our favorite Men’s Premium Jeans. If a straight fit is in order the Oliver denim jeans from Mott & Bow look, fit and feel wonderful. These premium denim jeans are handcrafted with quality and work nicely with a pair of nice shoes for upscale-casual. The Oliver denim is a 13 oz dark indigo from Orta Anadolu and is made of 99% Cotton and 1% Elastane. Mott & Bow classify the Oliver as a “comfort denim”. The mid-rise fit is great and the 1% Elastane keeps it from feeling too stiff. One of the best straight leg fits we’ve had in a while. The Oliver straights are zipper fly for convenience. The fly is a bit shorter typical of a mid-rise cut. They look good and the deep dark blue denim is very nice. Also available in Lt Blue and Raw denim. DML stands for Denim Made for Life and once you put on a pair you might agree. 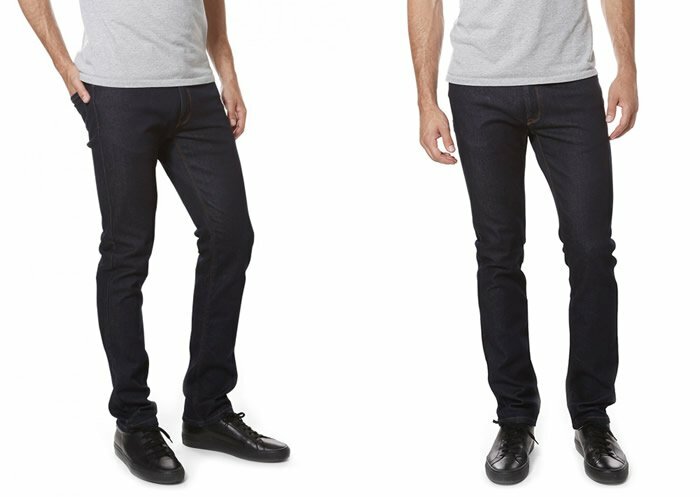 The Brixton Slim Fit men’s jeans are regular rise fit; comfortable and snug without being constricting. Flattering for slimmer body types. If you want a tight, contoured fit that isn’t super tight like Skinny Jeans, the Slim Fit is the way to go. The Brixton Slim Fit’s feature button fly style with large brass buttons. Traditional five pocket styling keeps things feeling natural. The design is nice with the variation in wash and subtle streaks. Made of 98% Cotton and 2% Elastane that gives a little bit of stretch that is makes the Brixtons feel great. 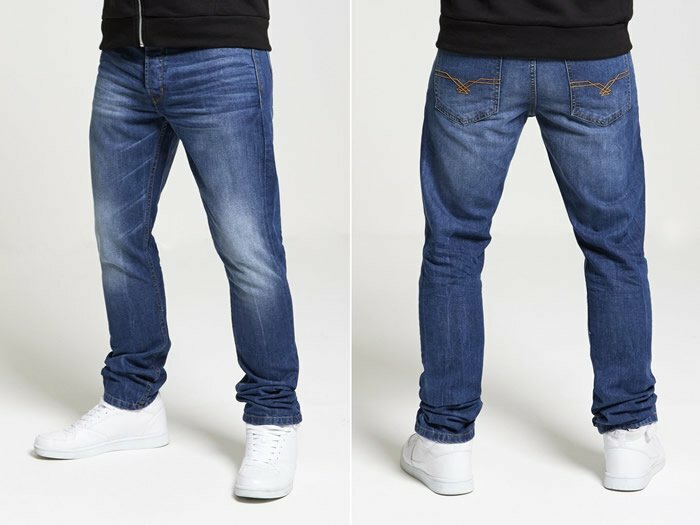 Premium jeans reasonably priced at £34.99 which is about 50 bucks at this time, we fell in love with the Brixton Slim Fit jeans. Available in Rinse wash, Dark Wash, Mid Wash, Bleach Wash, Blue Coated Wash, Charcoal and Black. 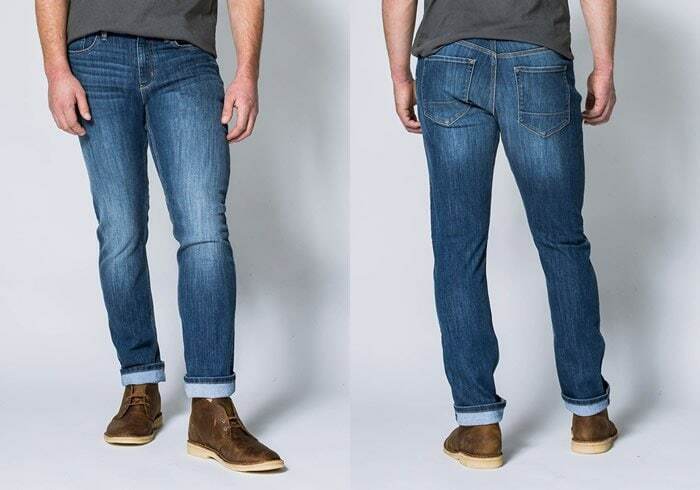 The Reydon Jean Portland Relaxed jeans are designed with a modern relaxed leg fit. They’re low-rise jeans with a traditional 5 pocket design and zipper fly. There’s a genuine leather logo back patch on the belt line with logo embossed button. On the interior the hand-pockets are black and white striped for a nice touch. 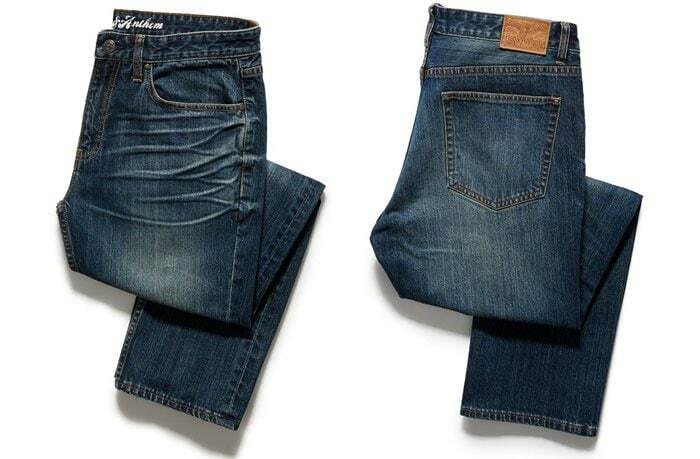 The medium wash denim features soft lighter patches on the thigh area with a cool wrinkled variation across the waist. The Reydon is a relatively heavy denim jean but feature a soft interior that is very comfortable. The softness isn’t silky, it’s not that kind of softness. The denim offers a more subtle softness that is very comfortable and is NOT flimsy. Appropriate for everyday and urbanwear for comfort and durability. Sizing was very natural, roomy enough to be called relaxed yet cut well so the fit falls well on skinny dudes as well as stockier types. Mugsy Jeans makes extremely comfortable high-stretch athletic fit jeans if you want jeans that don’t really feel like jeans. The slim fit Fultons have a nice deep blue dark wash with some faded color over the thigh and hamstring areas for subtle variations. They are shrink-resistant and super flexible. If you wanted a pair of jeans you could easily throw a few martial arts high kicks these would be the ones to wear. Kidding aside, the Fultons are one of the most comfortable jeans we’ve ever worn. They look like jeans but feel more like sweatpants. 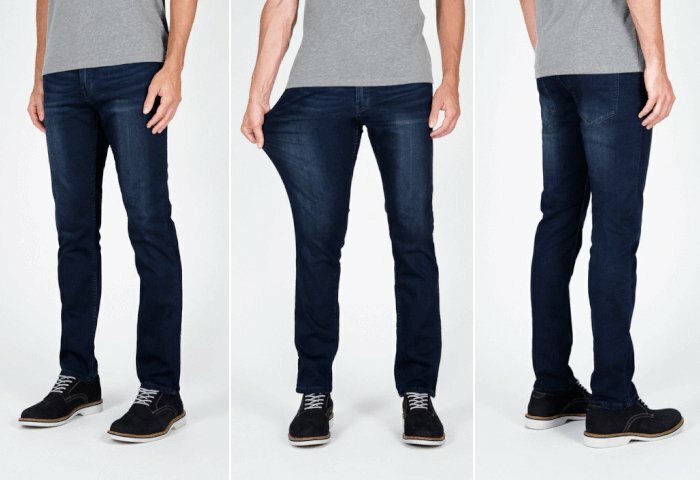 They’re lightweight and breathable and work well for thin dudes; the sizing falls somewhere between skinny and slim fit and may be slightly on the tighter side for some. All jeans will bleed in the early stages, especially darker styles. Avoid sitting on light-colored furniture and wearing light-colored clothing or shoes for the first few wears until the dye fully sets in and has stopped bleeding. If you are an athletic guy and want jeans that don’t feel like jeans the Performance Denim Relaxed fit jeans from DU/ER in worn stone are worth a gander. The DU/ER PD gives a nice, comfortable and soft fit with its lightweight and durable L2X™ fabric that provides super stretch. Additionally DU/ER integrates COOLMAX fibers into the denim material to promote moisture wicking and insulation for warmth in the cold. The DU/ER Performance Denim jeans keep you agile, almost as if you were wearing sweatpants. Yes they’re that comfy. For slender guys they might feel slightly loose in the hips and might consider downsizing. If you’re muscular with tree trunk type thighs or pack much back, these work well for an athletic body type. Machine wash cold, inside out with like colors. Only use non-chlorine bleach when needed. Do not use silicone softeners. Tumble dry and warm iron when necessary. Some of the brands included in this article have provided us with samples of apparel as a courtesy so that we could bring readers our first hand experience of our design evaluation & testing for wearability.